Jan Albers, rObinhOOd, 2019. 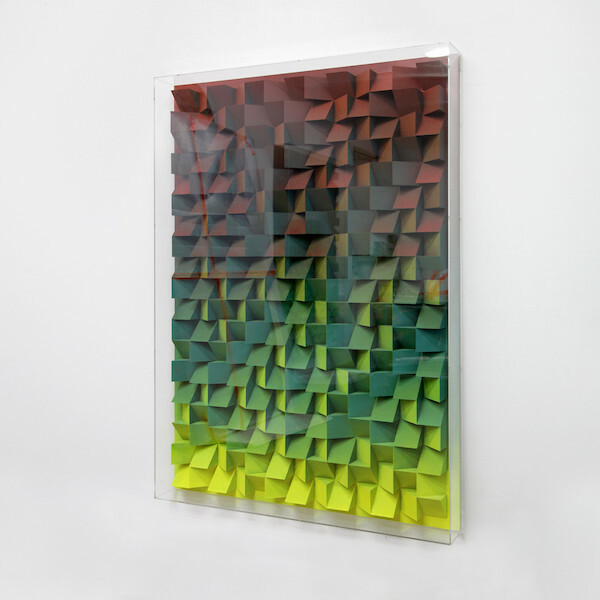 Spray paint on polystyrene & wood in acrylic glass box, 201 x 141 x 21cm. Courtesy: the artist and Fox Jensen Gallery, Auckland. Jan Albers works seamlessly across various media. Having studied painting at the Kunstakademie Dusseldorf, he sensed early on that working within the established protocols of paint and canvas felt limiting. Thus, his practice sees him fold, cast, paint, shape, cajole and pressure material to make objects that conflate and enliven the orthodoxies of the dominant genres. Audiences are compelled to look into these works rather than at them, from a respectful distance; the enticement and persuasion of the poisonous perhaps. Their complex topography, their nooks and crannies, their structural depth and intricacy suggest an entirely different reading of space that isn’t pictorial nor is it truly sculptural. Whatever the case Albers is certainly up-dating the bas-relief and its traditional viewpoint. Jan Albers will be present for his exhibition opening.